Welcome to the website for Wooster School. If you are a newcomer to the Wooster community, this site will serve as an introduction and overview of who we are, what we do, and how we do it. 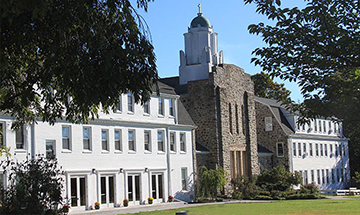 Unfortunately, you can't hope to understand the depth of our students' experience here without visiting, talking to our students and teachers, and getting a feel for how we make meaning every day on our beautiful 127 acre campus. Founded in 1926, Wooster has stayed true to an ethos which puts students and their learning at the center of all that we do. Learning here is personal, meaningful and visible. It's also a lot of fun. At Wooster, students develop essential skills in reading, writing, speaking, numeracy, and the fine and performing arts while applying these skills as thinkers, designers, creators, and problem-solvers. Every day we strive to help students discover their strengths and passions as they learn how to make their own meaning of the complicated world in which we live. Our students form a community. They learn to lead and follow. They clean and maintain the campus together, live by an honor code, and learn how to be “gentle, generous, truthful, kind and brave." Our strictest requirement for students is that they think about the person that they want to be, and show us that person every day. When you think about it, what else is there? Thanks for visiting us virtually. Hopefully next time you can come see us for real.